It seems that where ever we go the kids manage to make friends. (They definitely get this from their dad.) Today was the second time Mattey and Kade played with their new friend. She lives two doors down from where we're staying. Her name is (this is the way to pronounce it because I don't know how to spell it) Nee-mine. She has the most striking light blue eyes that really pop out from her dark hair. 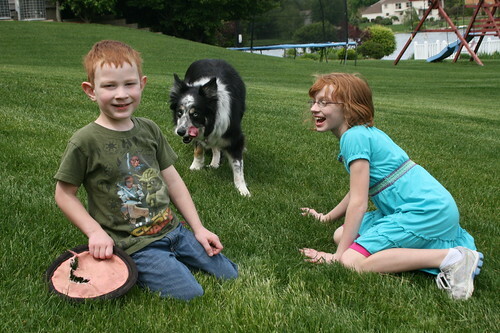 She's loves to play outside, especially with a frisbee. The reds played outside for a LONG time this afternoon while I cleaned out Jan's pantry. Meg was at a talent show practice at school. I can't wait to send them out to our backyard. Only a few more days left to wait. I wonder what friends they'll make there. Amen to Mickey making friends, and lucky Jan for getting free almost-professional pantry organization! Mickey was always able to make new friends. Maybe because he didn't have any brothers or sisters until he was 11 1/2. We would go to a park to camp for the weekend and before we knew it he had somebody he found to play with. He had a lot of friends around our neighborhoods too. I totally agree - lucky Jan for the "maid" service. Can't wait to see the new house! The Dogs name is Me and My. The other dog's name is Crayon so they are Me and my Crayon. Thanks for the clarification on the dog's name, Michelle. I was going by what the kids said the owner said. Lost in translation or something like that. The dog seemed to respond to the new pronunciation pretty well. Maybe she's used to people butchering it.